Erwin Wurm (b. 1954 Bruck an der Mur/Styria, Austria; lives and works in Vienna and Limberg, Austria) came to prominence with his One Minute Sculptures, a project that he began in 1996/1997. In these works, Wurm gives written or drawn instructions to participants that indicate actions or poses to perform with everyday objects such as chairs, buckets, fruit, or knit sweaters. 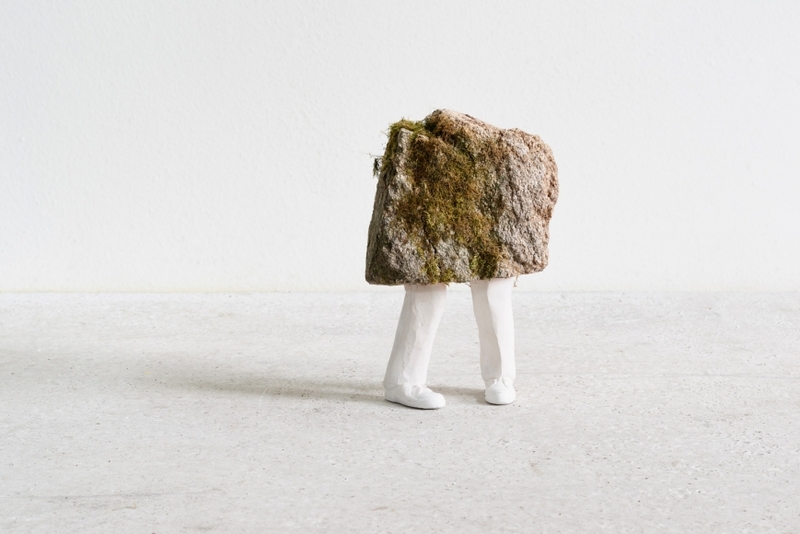 These sculptures are by nature ephemeral, and by incorporating photography and performance into the process, he challenges the formal qualities of the medium as well as the boundaries between performance and daily life and spectator and participant. While in this series he explores the idea of the human body as sculpture, in some of his more recent work, he anthropomorphizes everyday objects in unsettling ways, like contorting sausage-like forms into bronze sculptures in Abstract Sculptures, or distorting and bloating the volume and shape of a car in Fat Car. Wurm considers the physical act of gaining and losing weight a sculptural gesture, and often creates the illusion of bodily growth or shrinkage in his work. While Wurm considers humor an important tool in his work, there is always an underlying social critique of contemporary culture, particularly in response to the Capitalist influences and resulting societal pressures that the artist sees as contrary to our internal ideals. Wurm emphasizes this dichotomy by working within the liminal space between high and low and merging genres to explore what he views as a farcical and invented reality. Erwin Wurm graduated from University of Graz, Austria, in 1977, and Gestaltungslehre University of Applied Art and Academy of Fine Art, Vienna in 1982. Solo exhibitions of his work have been recently been organized at Albertina Museum, Vienna (2018); 21er Haus, Belvedere, Vienna (2017); Museum Küppersmühle für Moderne Kunst, Duisburg, Germany (2017); Leopold Museum, Vienna (2017); Centro Cultural Banco do Brasil, São Paulo, Brazil (2017); Berlinische Galerie, Berlin (2016); Schindler House, MAK Center for Art and Architecture, West Hollywood, CA (2016); Bangkok Art and Culture Center, Thailand (2016); Indianapolis Museum of Art, IL (2015); Museum of Contemporary Art in Kraków, Poland (2013); Centro de Arte Contemporáneo de Málaga, Spain (2012); and Dallas Contemporary, TX (2012). Select group exhibitions featuring his work include Performing for the Camera, Tate Modern, London (2016); Precarious Balance, Centre of Contemporary Art, Christchurch, New Zealand (2016); Desire for Freedom, Museum of Contemporary Art in Kraków, Poland (2013); HEIMsuchung: Uncanny Spaces in Contemporary Art, Kunstmuseum Bonn, Germany (2013); The Original Copy: Photography of Sculpture, 1839 to Today, Kunsthaus Zürich, Switzerland, traveled to The Museum of Modern Art, New York (2011); and Temporary Structures: Performing Architecture in Contemporary Art, deCordova Sculpture Park and Museum, Lincoln, MA (2011). Wurm’s work is in numerous international public and private collections, including Albertina, Vienna; Albright-Knox Art Gallery, Buffalo, New York; Centro de Arte Contemporáneo de Málaga, Spain; Centre Georges Pompidou, Paris; Kunsthaus Zürich, Switzerland; Kunstmuseum Bonn, Germany; Museo d’Arte Moderna di Bologna, Italy; The Museum of Modern Art, New York; Solomon R. Guggenheim Museum, New York; Vancouver Art Gallery, Canada; and Walker Art Center, Minneapolis. In 2011, Wurm’s “Narrow House” was installed at the Palazzo Cavalli Franchetti as part of Glasstress 2011, a collateral event of the 54th Venice Biennale. In 2017, Wurm returned to Venice for the 57th Biennale, where he represented Austria.